The Gingko Avenue of Jingugaien (神宮外苑銀杏並木) is one of the most famous Gingko spot in Tokyo. There are four rows of Gingko trees, 146 trees in total. In the beginning of December, they will have beautiful Koyo. Many people enjoy this splendid yellow view during the season. There is parking but no restroom. 1. use Ginza Line to Aoyamaicchome. This Gingko Avenue was made by Masuki Fujii in 1908. 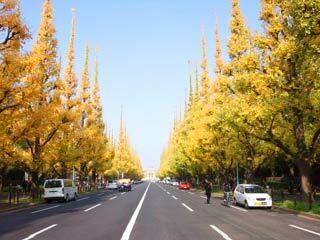 The Gingko avenue is about 300m long. Because of its beautiful scenery, many people including the media visit this avenue to enjoy Koyo.